Torch Browser is a custom web browser based on Google Chrome, provided by Torch Media, that claims to improve the browsing experience of users, by integrating its own media player, media grabber, torrent engine, gaming platform and some other plugins. However, some security experts believe that this browser might be a potentially unwanted program or a PUP and may collect and share some user information possibly for income-generating purposes. Our research team has looked into the browser to see what it does if installed. Download a System Scanner, to See If Your System Has Been Affected By Torch Browser. Torch Browser – How Does It Work? Torch Browser can be either downloaded from its website (www.torchbrowser.com) or while installing other third-party software. 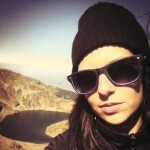 The site has a good design and appears legitimate. However, there were certain issues that we found with this software. As visible above, some of the statements contradict each other, more precisely, the statements regarding third parties possibly collecting information via cookies or other methods. At the first paragraph, it Is stated that the company could use third parties and individuals, and they may collect information to improve the service. And at the second paragraph, they have stated that they do not share information with third party sites, but despite that, these sites may collect information. Also, it is unspecified what type of information may be obtained (non-personal or personal). We have attempted to download and install Torch Browser on a machine. The first thing we noticed is that the installer prompted us to change homepages of two other browsers to ask.com. It also requested to install ‘Torch Movies Search App’ extension as a bundle add-on to all of our web browsers. After many permission requests during installation, we have managed to set up Torch Browser on our PC. What we noticed initially was that when we ran it for the first time, it situated four other icons on the desktop, linking to own web site pages and their services. When we opened the browser, we observed that it was based on Google Chrome with the difference that its search engine, powered by ask.com was full of third party advertisements that may redirect to other websites. 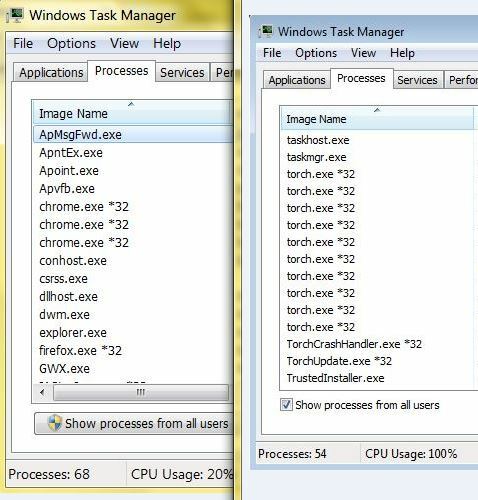 Also, there were some other suspicious symptoms such as the task manager processes. When we compared Torch Browser processes against Google Chrome (on which it is based on), we have found that the number of executable files was unusually high (and we didn’t open more than one tab on each). However, the most prominent symptom to make us believe that the software from Torch Media was unwanted on our computer is when we performed our final scan. It showed around 590 unwanted objects, connected with the bundled ‘Movies Search App’ we wrote about earlier, added to the other browsers. How To Remove Torch Browser? If you feel unsafe when using this browser and you need to remove it, you should guide yourself by the after mentioned step-by-step tutorial to completely eradicate all files. It is also highly recommended (if you are not a professional in cyber security) to install special software that will detect such threats and protect you regularly from them. 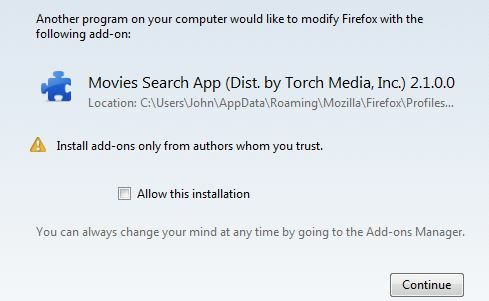 Follow the instructions above and you will successfully uninstall Torch Browser. After Torch Browser is removed, restart Mozilla Firefox by closing it from the red “X” in the top right corner and start it again. From the opened “Extensions” menu locate Torch Browser and click on the garbage bin icon on the right of it. After Torch Browser is removed, restart Google Chrome by closing it from the red “X” in the top right corner and start it again. Select Torch Browser to remove, and then click ‘Disable’. A pop-up window will appear to inform you that you are about to disable the selected toolbar, and some additional toolbars might be disabled as well. Leave all the boxes checked, and click ‘Disable’. After Torch Browser has been removed, restart Internet Explorer by closing it from the red ‘X’ in the top right corner and start it again. A pop-up window will appear asking for confirmation to uninstall Torch Browser. Select ‘Uninstall’ again, and the Torch Browser will be removed. 3. Remove Torch Browser automatically with Spy Hunter Malware - Removal Tool. 3. Remove Torch Browser automatically with Spy Hunter Malware – Removal Tool. Threats such as Torch Browser may be persistent. They tend to re-appear if not fully deleted. A malware removal tool like Combo Cleaner will help you to remove malicious programs, saving you the time and the struggle of tracking down numerous malicious files. Threats such as Torch Browser may be persistent on your system. They tend to re-appear if not fully deleted. A malware removal tool like SpyHunter will help you to remove malicious programs, saving you the time and the struggle of tracking down numerous malicious files. Note! Your computer system may be affected by Torch Browser and other threats. SpyHunter is a powerful malware removal tool designed to help users with in-depth system security analysis, detection and removal of threats such as Torch Browser. 1. Install SpyHunter to scan for Torch Browser and remove them. 2. Scan with SpyHunter, Detect and Remove Torch Browser. Ransomware infections and Torch Browser aim to encrypt your files using an encryption algorithm which may be very difficult to decrypt. This is why we have suggested several alternative methods that may help you go around direct decryption and try to restore your files. Bear in mind that these methods may not be 100% effective but may also help you a little or a lot in different situations. Note! Your computer system may be affected by Torch Browser or other threats. Remove Torch Browser by cleaning your Browser and Registry. Fix registry entries created by Torch Browser on your PC. 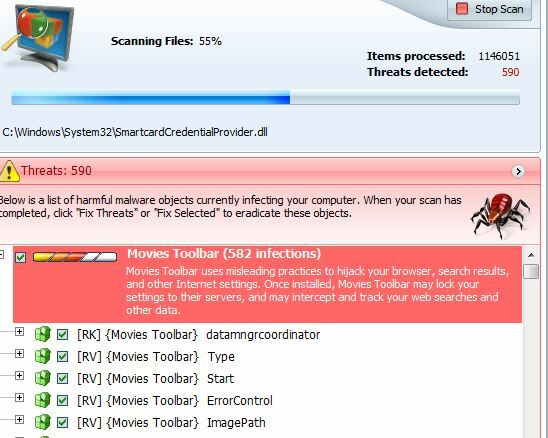 Combo Cleaner is a powerful malware removal tool designed to help users with in-depth system security analysis, detection and removal of threats such as Torch Browser. Step 5: In the Applications menu, look for any suspicious app or an app with a name, similar or identical to Torch Browser. If you find it, right-click on the app and select “Move to Trash”. Step 6: Select Accounts, after which click on the Login Items preference. Your Mac will then show you a list of items that start automatically when you log in. Look for any suspicious apps identical or similar to Torch Browser. Check the app you want to stop from running automatically and then select on the Minus (“–“) icon to hide it. Remove Torch Browser – related extensions from your Mac’s browsers. A pop-up window will appear asking for confirmation to uninstall the extension. Select ‘Uninstall’ again, and the Torch Browser will be removed. When you are facing problems on your Mac as a result of unwanted scripts and programs such as Torch Browser, the recommended way of eliminating the threat is by using an anti-malware program. Combo Cleaner offers advanced security features along with other modules that will improve your Mac’s security and protect it in the future. la prima e che il browser usa torch(. )start.me e non Ask(. )com, la seconda e che le 4 icone sul desktop che avete riscontrato ( Free Music, Free Games etc) non si sono installate sul mio pc…non so forse a distanza di due anni Torch ha e diventato piu sicuro…aspetto un vostro riesame prima di cancellarlo. Don’t forget that browsers such as Torch tend to change their homepages in time. Those were the ones in use when we did the research. Hey !, I found this information for you: "Torch Browser Removal Manual". Here is the website link: https://sensorstechforum.com/torch-browser-removal-manual/. Thank you.